Asus adds a terrific feature to its ZenBook Pro line. 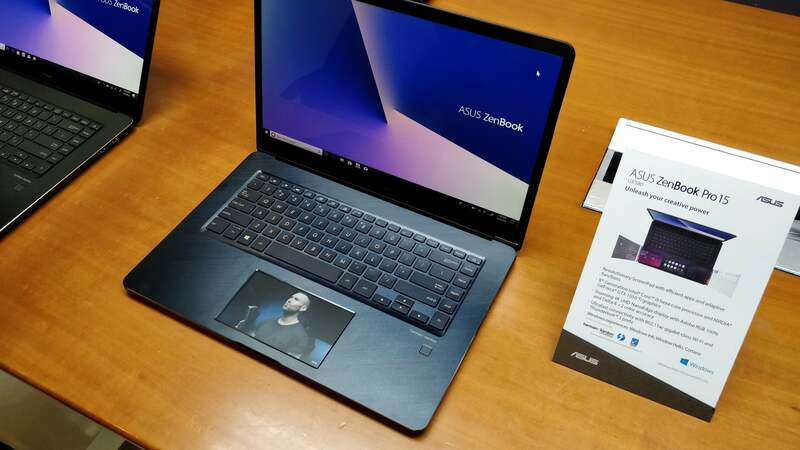 The Asus ZenBook Pro has always strived to offer a balance between price and performance, but its appearance settled upon the relatively mundane. No longer. The Asus ZenBook Pro 15 (UX580) Asus showed off at Computex features the ScreenPad, a vibrant, amazing second screen that does double duty as a touchpad. Think of the UX580 as building off the recently announced UX550G, which included Intel’s premium Core i9 microprocessor, along with the Nvidia GeForce GTX 1050 Ti graphics. The ZenBook Pro also features a 4K “NanoEdge” display that has been tuned for 100-percent Adobe RGB and Delta-E <2 color accuracy. ScreenPad is controlled by the F6 button on the display, which cycles through several available modes. Turned off, ScreenPad looks, feels, and acts like an ordinary touchpad. When ScreenPad is enabled, though, it’s immediately apparent that you’re carrying something special. Wait, is that a video screen? Yes, it’s the Asus ScreenPad. The basic ScreenPad mode essentially treats ScreenPad as a screensaver of sorts, projecting a pleasing static background onto your trackpad. While it’s a nice accent to the laptop, there’s nothing that functional about it. Putting ScreenPad into Extension Display mode allows you to treat ScreenPad as a secondary display (in our video, we’re playing a YouTube video in “full screen” mode). You can also use it as a fine-grained control panel of sorts. Asus said that it has worked with Microsoft to put Office controls into ScreenPad, and plans to work with more developers. A ScreenPad SDK is also planned as well. According to an Asus spokesman, placing these controls under your fingers—such as a slider to adjust the line width or tint—is more intuitive and easier to control than it would be on the main touchscreen. That’s an argument that ScreenPad is more than a gimmick. We didn’t have the ScreenPad resolution at press time. Asus tells us the $2,299 Asus ZenBook Pro 15 (UX580) will ship by late July, so you’ll have a chance to try it out soon.